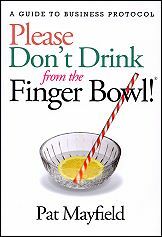 Description: Written from a sales executive’s perspective, Please Don’t Drink from the Finger Bowl! provides practical advice and information on what to do and how to handle difficult situations with courtesy and grace. The book includes a wide range of business and general protocol topics. A FAQ section is based on questions asked during Pat’s numerous training programs. Topics: Basic protocol, networking, meetings, seating arrangements, e-mail, tele- and cell-phone manners, general entertaining guidelines, tipping, the “toast,” business and beverage, and general manners for dining and business entertaining. "It's another home run for Pat Mayfield! A 'must read' book for those in business wanting to improve. Executive coaches will want every client to have a copy." -Ron Robinson, Former Chairman, Cranford Johnson Robinson Woods"
"From shaking hands to sushi, Pat covers the gamut for building one's comfort zone in business and social settings." -Dr. Tess Collins, Author, "How Theater Managers Manage"
"The realistic examples are the best part of this book because these are situations we experience in business every day. Pat's sense of humor adds a wonderful touch!" "For the professional looking for a competitive edge, this book is a wealth of information written by a real pro!" © Copyright 2006-2013 Pat Mayfield Consulting, LLC. All Rights Reserved.